OK so you are a Windows phone user and you feel kinda lonely as most people choose for Android or iPhone’s. But to make you feel a little bit more happy we thought that we would show you this keychain. The metal keychain has a special Windows Phone 7 picture on it and you know when there is merchandise for it then it has to be amazing. 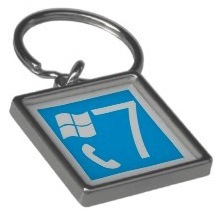 Come check out this Windows Phone 7 Keychain.